NOTE: Internet upload speeds in Jordan are just as bad as they were in Israel. I will upload the pictures when I can find a better connection. We woke up at 4:15am this morning because we wanted to watch the sunrise from on top of Masada. To clarify from my last post; Masada was an ancient city built on a mountain top next to the Dead Sea. 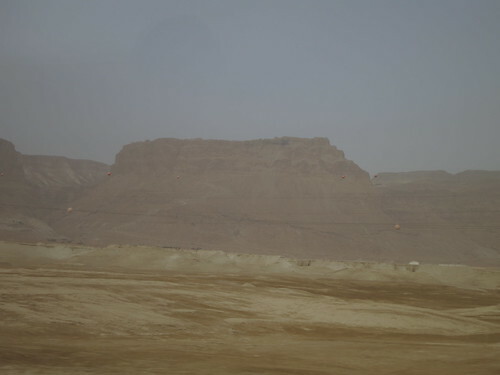 The Masada Guest House, where we slept, is on the bottom of this mountain. We hiked up snake's trail, for one hour, to make it to Masada. The sun peaked up over the Jordanian mountains, across the Dead Sea, just as we arrive at the peak. Steve gave us a tour of Masada after we took pictures of the beautiful view. 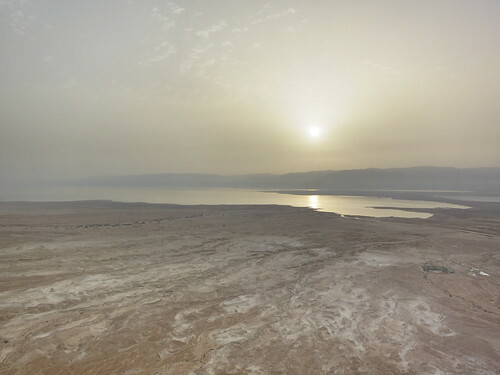 We could only imagine what the view looked like before the Dead Sea dried up (diversion of the stream to the Israeli Water carrier has reduced the Dead Sea's level 26m). At the Israel- Jordan boarder, we bid farewell to our steadfast guide, Steve and our bus driver, Yuri. Our Jordanian guide, Wafi and bus driver, Abu-Islam were waiting for us at the border. A young man, Abdellah, from the "Tourist Police" joined our bus for protection during our stay. 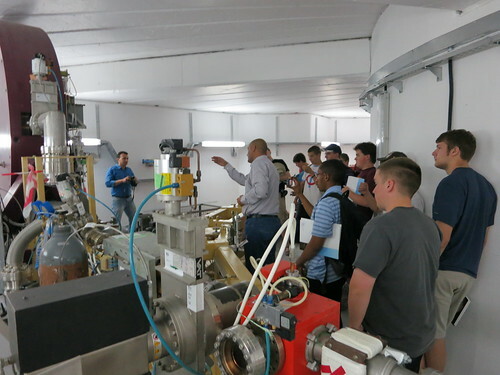 We crossed into Jordan and and made our way to visit the Synchrotron-light for Experimental Science and Applications in the Middle East (SESAME) in Allan. 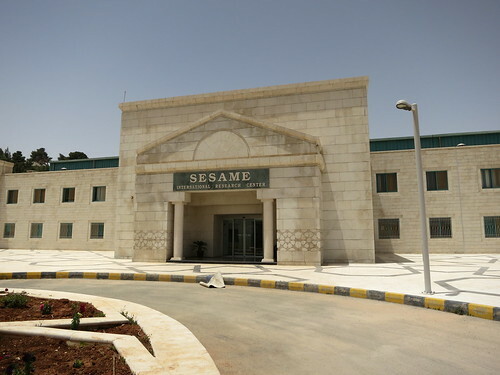 The SESAME research center is currently under construction and will not be finished until 2015. However, many of the main parts have been transported to the site and assembled. We listened to a short presentation on SESAME and then toured the site. SESAME was modelled after CERN but has members from the middle east instead of Europe. The members include Bahrain, Cyprus, Egypt, Iran, Israel, Jordan, Pakistan, Palestinian, and Turkey. The absence of many of the gulf states made if hard to raise funds for the project. The site ended up in Jordan because King Abdullah II offered to pay for the construction costs of the facilities. Note that Jordan is not an oil bearing state. The equipment is a combination of new pieces and upgrades to donations from many European and American research centers. 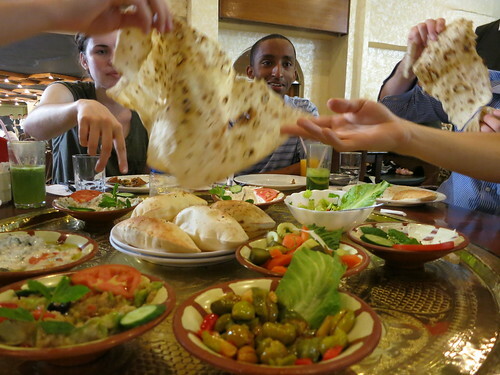 After SESAME, we went out for lunch at Taween Al Hawa in Amman. The service at the restaurant was top notch - prescient of the rest of the day. We ate a three-course meal of eight different appetizers, an assorted meat plate and fresh watermelon to top it off. The waiters served everyone at the table by dishing up each new item. In addition, dirty dishes seemed to disappear as the waiters grabbed them the instant they were finished. The early morning walk and huge lunch made most of us quite tired before dinner. In addition, we finished lunch at 4pm. Wafi suggested that we take the rest of the day off. We agreed and drove to the Jerusalem Hotel. The service at the hotel was also very comforting. Our bags were delivered to our rooms and we were served fresh grape juice in the lobby. The rooms in the hotel were very spacious and utilized lots of wood and marble. I hopped on my double size bed slept it off the food and my fatigue. Later tonight, we ate dinner at the hotel. The service was also impressive. The Hashimite Kingdom of Jordan has welcomed us to their land. My guess is that the service we are receiving is mainly due to our nationality. I look forward to seeing how the rest of the trip unfolds. The flight back to Minneapolis lingers on our minds more with each day.